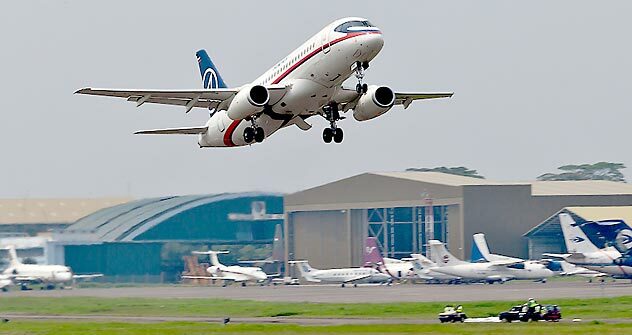 Sukhoi SuperJet 100 crash in Indonesia has experts arguing that the human factor brought about the accident. On Thursday, the wreckage of the Sukhoi SuperJet 100 (SSJ-100) that went missing during a road show in Indonesia was discovered on Mount Salak, a dormant volcano in West Java. The plane crashed into the steep slope of the mountain. There were 45 people on board, including eight Russian crew members and representatives of the Sukhoi company. The wreckage of the SSJ-100 was discovered by rescue helicopters at an elevation of about 5,200 feet; the mountain itself is about 1,600 feet higher. It appears that the plane crashed into the slope and the debris then dropped onto the wooded hillside. According to preliminary data, the crash occurred during controlled flight, which means it was a result of human error rather than technical failure. Early speculation about the cause includes the crew failing to see the mountain, which was shrouded in fog, or the pilots disregard for instrument data, which should have warned the crew about the danger in time to increase the plane’s altitude. This SSJ-100 was the third SuperJet in operation. Its maiden flight took place on July 25, 2009 and it had made more than 500 flights since then, totaling about 800 flight hours. Sukhoi specialists claim that there had been no problems with the plane, however aviation blogs have reported that it had problems as early as the assembly stage. They allege that the airframe was dropped and damaged. Sukhoi has not confirmed this information; moreover, specialists do not believe that, even if the allegations were true, they would have caused the Indonesia crash. Experts believe the accident was caused by a combination of factors. One of them was the crew’s lack of knowledge of the terrain and specific nature of flying in mountains, although the crew was headed by experienced pilot Alexander Yablontsev. Another factor might have been a possible misunderstanding between the crew and the air traffic controller. It has been reported that controllers lost contact with the plane after the pilot asked to descend to 6,000 feet and was advised to do so. Aviation experts believe that the pilots could have interpreted the information as a command, while the controller, unable to properly control the flight in the mountains, advised the crew to descend at its discretion. Experts also speculate that the only reason the crew ventured into the mountains to begin with was to showcase the plane’s capabilities to potential buyers and local journalists who were on board. While observers say a standard crew would never have taken such a risk, the one led by Yablontsev, who had been a test pilot and piloted the SSJ-100 on its maiden mission, very well might have. These versions of the story will likely remain unconfirmed, as the terrain will make it very difficult for rescuers to locate the “black box,” which could shed light on the events. The crew members and passengers on board the Sukhoi SuperJet-100 were insured for $300 million. There is a term in the aviation industry called “the organization of flight.” It is a process that includes the choice of the crew, route, flight lane, etc. The crash was due to poor flight organization. The terrain is very difficult in Java. The task was complex, with shifts in altitudes, so every step had to be charted inch by inch. It wasn’t just about turning up, flying and having a good time. It is a purely organizational mistake. The leader of the mission is the one responsible – the one who controlled where they were flying, why, and for what reason. Everything must be calculated. We are talking about the state’s image here, not just a plane flying. I have made many flights around the world. I had no navigator, no radio operator, I was by myself in a fighter cockpit, so I knew my responsibilities, knew that the honor of Russia was at stake. But to take off and crash the plane into a mountain! I can’t understand who organized it and who is responsible. There was nothing wrong with the plane. The plane is just a plane. Everything should be organized perfectly, the more so because it was a test flight – to show the plane to potential buyers. It seems there were three factors behind the accident. The first one is bad weather, the second is the hilly terrain, and the third one is the unfamiliar route. Unfortunately, this will affect the European market, because there have been similar accidents. For instance, the Tu-144, which crashed at Le Bourget. All foreign contracts were annulled after that. I’m afraid that the SuperJet’s future is now restricted to the Russian market. The test flight was meant to interest foreign companies, but contracts may be terminated now. The wreckage was discovered in a spot that is virtually inaccessible for land rescue missions, therefore only paratroopers can reach the place from helicopters. The weather is bad now, though, and helicopters cannot hang over one spot for people to descend. The mountain is high and is covered in thick forest that is hardly passable, while the wreckage is on a steep slope. It remains unstable, and debris keeps falling down. It was a test flight for local air carriers; I decided not to go, but take pictures from the ground. However, I took the same plane to get here, and other countries besides, so I know it quite well. The plane was fine, undamaged, without any problems.